Today is the first day of the week, and most of you are back at work today, but don’t worry, as the Holidays are coming up quick. With the holiday something fast approaching, you all may be getting ready for the holiday season. Do any of you have twins? Today’s optical illusion is all about a pair of twins, but there is something unusual about them. Can you see what we are talking about? 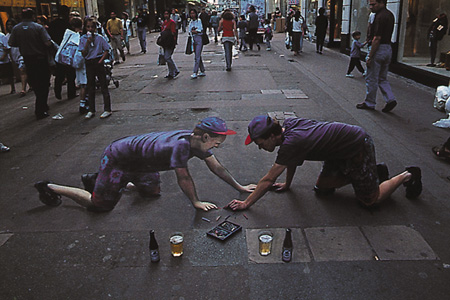 One of these men is real, and the other is a very clever chalk drawing. However, can you tell which one is which? That’s the sign of a good artist when you cannot tell who is real and who is a drawing! Ready to see another great hidden optical illusion? Take a look at this really cool waterfall. There is a hidden face in this waterfall, but you may have to look closely in order to see it. Actually, the more you look at the waterfall, the more you may see! With the way the water is falling behind the rocks, there may actually be more than one face in this waterfall. If you can see more than one face, please comment below and tell us all about it. Hope you have a good Saturday.